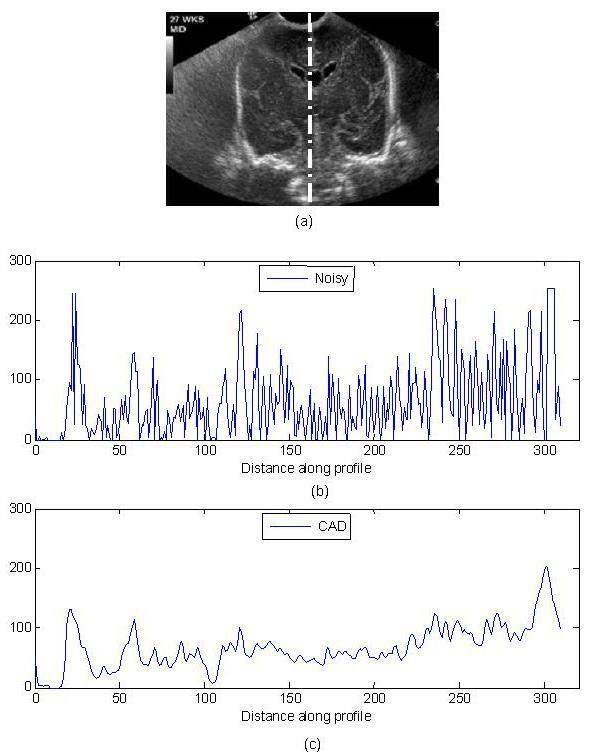 This article proposes a technique for speckle reduction in medical ultrasound (US) imaging which preserves the point and linear features with the added advantage of energy condensation regulator. Whatever be the post processing task on US image, the image should undergo a preprocessing step called despeckling. Nowadays, though the US machines are available with built-in speckle reduction facility, they are suffered by many practical limitations such as limited dynamic range of the display, limited number of unique directions that an US beam scan follow to average an image and limited size of transducer, etc. The proposed diffusion model can be used as a visual enhancement tool for interpretation as well as a preprocessing task for further diagnosis. This method incorporates two terms: diffusion and regulator. The anisotropic diffusion preserves and enhances edges and local details. The regularization enables the correction of feature broadening distortion which is the common problem in second-order diffusion-based methods. In this scheme, the diffusion matrix is designed using local coordinate transformation and the feature broadening correction term is derived from energy function. Performance of the proposed method has been illustrated using synthetic and real US data. Experiments indicate better speckle reduction and effective preservation of edges and local details. For more than two decades, ultrasonography has been considered as one of the most powerful techniques for imaging organs and soft tissue structures in the human body. Today, it is being used at an ever-increasing rate in the field of medical diagnostic technology. 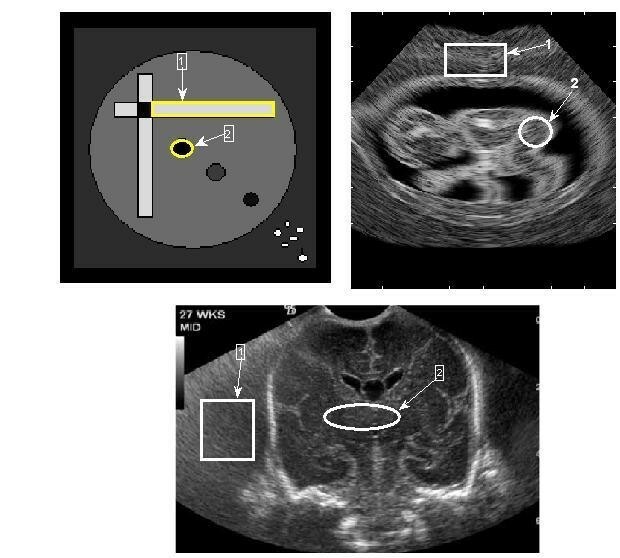 Ultrasonography is often preferred over other medical imaging modalities because it is non-invasive, portable, versatile, does not use ionizing radiations, and also relatively of low-cost. 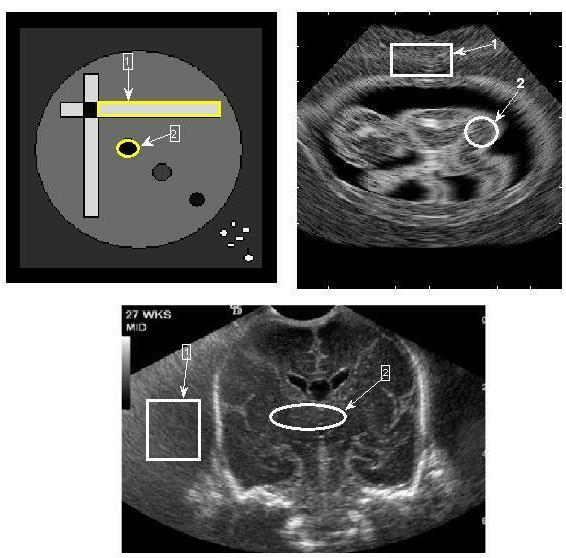 The images produced by commercial ultrasound (US) systems are usually optimized for visual interpretation because of its real-time usage. However, the usefulness of medical ultrasonography is degraded by signal-dependent noise called ‘speckle’ which is multiplicative in nature. Imaging speckle is a phenomenon that occurs when a coherent source and a non-coherent detector are used to interrogate a medium, which is rough on the scale of the wavelength. In medical images, noise suppression is particularly a delicate and difficult task. A tradeoff between noise reduction and the preservation of actual image features has to be made in a way that enhances the diagnostically relevant image content. Speckle reduction is needed for two main reasons: first is to improve the human interpretation, i.e., for visual enhancement and secondly, despeckling is the preprocessing step for many image processing tasks. Importance of despeckling is depicted in Figure 1. Many filters have been developed to cope up with speckle, with differences lying in the assumptions about the speckle model . The methods described by Lee , Frost et al. , and Kuan et al. [4, 5] are based on multiplicative model and simple logarithmic operation converts the speckle into additive noise. Filtering based on anisotropic diffusion (AD) was introduced by Perona and Malik  who had constituted a powerful tool for signal and image enhancement. When AD is introduced for first time an undesirable effect called “pin hole effect” may result and this is addressed by Monteil and Beghdadi  through optical flow technique. Later, Yu and Acton  have proposed a novel filtering scheme based on the filters first described by Lee and Frost. The authors find a relation between the former and the AD equation and give rise to a speckle removal filter, which they call speckle reducing anisotropic diffusion (SRAD). This filter has shown very good performance with different levels of speckle. However, SRAD tends to broaden thin linear features and point features. These features carry useful information for diagnosis and the problem need to be corrected. To overcome the feature broadening problem, a method has been proposed by Acton . This method combines the strength of SRAD and deconvolution restoration. This technique assumed that feature distortion is caused by the convolution of the point spread function of the imaging system with the underlying feature. Hence, deconvolution sharpens features, while SRAD removes the speckle. 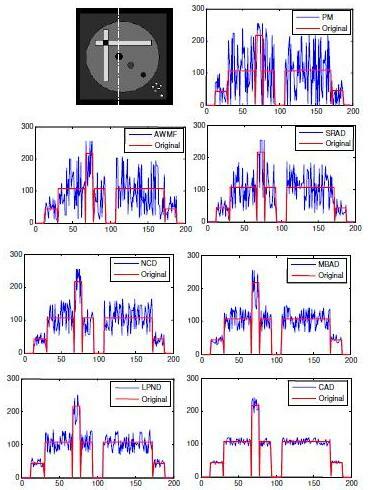 This method showed promising results on synthesized US data, although no results were reported for real data. A generic framework to find the matrix-valued counterparts of the Perona–Malik PDE with various diffusivity functions is proposed by Burgeth et al. .
Fourth-order partial differential equation (PDE)-based despeckling method has been proposed in . This can reduces the speckle and also able to keep the image edge better, but this method requires more number of iterations to converge. Regularization methods have been used in real-valued image restoration [12, 13], as well as image reconstruction problems such as medical tomography [14, 15] to obtain improved image estimates in the face of data degradation. The simplest and the most common approach is to use quadratic functions of the unknown quantities. These methods lead to computationally straightforward optimization problems, but they suppress useful features in the resulting imagery, such as edges. Recently, considerable effort has been spent in designing alternative, non-quadratic constraints which preserve such features. Methods based on these non-quadratic constraints have successfully been used in edge-preserving regularization in image restoration  and computer-assisted tomography [13–16]. In this article, a new method has been proposed to reduce speckle in US images by incorporating a non-quadratic regularization into nonlinear coherent diffusion to preserve and enhance edges, local details, and to correct the feature broadening distortion. The proposed model carries two terms: the first is coherent diffusion term that reduces the speckle by nonlinear coherent diffusion, which utilizes the diffusion tensor derived from coordinate transformation. The second term is called regulator, which enhance the performance of coherent diffusion as well as it enables the correction of feature broadening distortion. Therefore, our model performs simultaneous speckle reduction, structure enhancement, and feature broadening correction with minimum computational cost. The basic idea in the use of PDEs in image processing is to deform an image, a curve, or a surface in a PDE framework and to approach the expected result as a solution to this equation. Let I:Ω → ℜ be a scalar-valued image (gray level image) with Ω ⊂ ℜ p . Gradient of the image characterizes the difference in gray value. In Biomedical imaging, besides noise also edges result in a large gradient at fine scales. The direct approach to reduce variations in the image I would be to reduce the gradient of the image globally. Calculus of variations is a mathematical tool with the help of which we can find the extrema of functionals. where ∂Ω is boundary of Ω and n is normal vector of boundary. Euler–Lagrange equation makes the link between PDEs evolution and gradient descent for continual minimization. This equation appears in many physical transport processes. In the context of heat transfer, it is called heat equation. In image processing, we may identify the concentration with the grey value at a certain location. If the diffusion tensor is constant over the whole image domain, one speaks of homogeneous diffusion whereas a space-dependent filtering is called inhomogeneous. Often the diffusion tensor is a function of the differential structure of the evolving image itself. Such a feedback leads to nonlinear diffusion filters. Diffusion which does not depend on the evolving image is called linear. Sometimes the computer vision literature deviates from the preceding notations, i.e., the homogeneous filtering is named isotropic and inhomogeneous blurring is called anisotropic, even if it uses a scalar-valued diffusivity instead of a diffusion tensor. With initial condition: I ( x , y , 0 ) = I 0 , I ( x , y , 0 ) ; ℜ 2 = ℜ + is an image in the continuous domain, where (x, y) specifies the spatial position; t is an artificial time parameter; с is the diffusion constant, and ∇I is the image gradient. The с value is suggested to provide backward diffusion around intensity transitions and forward diffusion in smooth areas in favor of edge sharpening and noise removal. Edges and local details are the most interesting parts in diagnostic imaging for clinicians. Therefore, enhancement and preservation of edges and local details on denoising are very important. In Equation (9), с is a scalar function and ∇I serves only as an edge detector rather than providing smoothing. The Hessian matrix is more sensitive to noise; therefore, the structure tensor is favored. The following diffusion tensor is proposed in nonlinear coherent diffusion (NCD) model  to obtain selective smoothing along the gradient and contour direction. where the eigen vectors ω1 and ω2 represent the directions of maximum and minimum variations and the eigen values μ1 and μ2 correspond to the strength of these variations, respectively. However, the diffusion tensor used in the nonlinear coherent diffusion model was actually depending on local statistics which are isotropic in nature, and also on the tensor provided by Gaussian smoothed image which may not effectively suppress the spatially correlated speckle noise. For many years, image regularization with discontinuities (edges) preservation has been studied in the computer vision community. Image regularization with PDE is again based on a measure of local parameter variations. In Equation (14), the first term is regularization term α coupled with data attachment or fidelity term (Ii 0 − I i ). U = ( u 1 , u 2 , … , u n ) is the n × n orthogonal matrix of the unit eigen vector columns u k , forming an orthonormal vector basis. A = diag ( λ 1 , λ 2 , … , λ n ) is the corresponding diagonal matrix of the positive eigen vectors. The spectral decomposition separates the orientation features and diffusivity features A of tensor D.
For instance, to remove the noise effectively and to avoid the vision of undesired image structures, isotropic smoothing is preferred in homogeneous regions. Followed by, in order to preserve the vector edges while removing the noise, the diffusion should occur along the vector edges. And diffusion rate should be decreased in order to prevent the corner erosion. These conditions can be satisfied through the use of local coordinate transformation in the design of diffusion tensor. 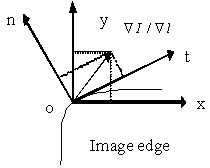 As shown in Figure 2, at the edge point o, for t ⊥n, n → , t → are unit normal and unit tangent vectors, n → = ∇ I ∇ I , t → = ∇ I ⊥ ∇ I .
Decomposition of directional derivative on image edge. where λ1 and λ2 are diffusion coefficients along the direction of normal and tangent directions. In the NCD model , λ1 and λ2 are related to eigen value correspond to strength of maximum and minimum variations. In the constant regions, μ 1 ≈ μ 2 ≈ 0 and λ 1 ≈ λ 2 ≈ α , which gives D ≈ αI d where, I d is identity matrix. Thus, in the constant (homogeneous) region, there is no preferred diffusion direction and the diffusion tensor is isotropic. For image contours, μ 1 > > μ 2 > > 0 and λ 2 > λ 1 > 0 , diffusion tensor is anisotropic and mainly directed by the tangent vector of the image. The proposed CAD model is composed of two components: the nonlinear coherent diffusion component and the energy condensation component. The former accounts for speckle removal and the latter reduces the broadening distortion of point and linear features. According to the number of scatterers per resolution cell, the nature of speckle pattern is classified into three categories: Fully formed speckle (FFS) pattern , non-randomly distributed with long range order [21, 22], and non-randomly distributed with short range order . The region corresponds to FFS carries less tissue information, i.e., small gradient variations and the diffusion must become isotropic along all directions, i.e., λ1 ≈ λ2. This condition can be accomplished by setting the local coherence measured by μ1 − μ2 close to zero. On the other hand, the areas of edges and local details corresponding to structured tissue carries rich information about the imaged texture, i.e., big gradient variations. Therefore, the AD is needed in domains of edges and local details, which diffuse along the tangent direction of edges and not across the edges. In Equation (21), λ1 is related to big gradient variation through Tukey’s bi-weight robust estimator  and ( λ 1 − λ 2 ) > s 2 is related to fully structured region and diffusion occurs only in contour direction that is along t. The stopping level s2 can be set manually. To emphasize thin linear and point features in US image, which bear useful information for diagnosis, an energy condensation component is included in the proposed model. In Equation (16), I c is threshold value, which is set as mean of the image function I(x,y). The weight factor β is positive and it determines the amount of speckle smoothing, point and linear feature preservation. With γ < < 1, the proposed condenser performs the following operation: First, the bright regions correspond to I ≥ I c gets fat during the diffusion process and increases the total energy rapidly. Second, the majorities of darker regions corresponding to I < I c , undergo NCD as I I c γ → 0 . Thus, the condenser prevents the fattening of bright and linear structures without affecting the diffusion performed by the first term in Equation (16). In the implementation of CAD model α = 1 , s = 70 , β = 0.05 , γ = 0.75 , I c = I are chosen. After the iteration, the energy of the updated I is rescaled by a factor of I 0 I 0 , where 〈〉 is mean value. Thus, the processed image has same energy as the input I0. When β = 0, the image region undergoes nonlinear coherent diffusion. The β value should be chosen such that it prevents the fattening of bright structures without affecting normal non linear coherent diffusion in dominant image regions. The technique in  can be used to find the value of β. As the diffusion process is iterative, the important task lies in deciding the stopping criteria. Several automatic optimal stopping time estimation criteria are available in the literature [24–26]. In our simulation, we preferred the mean absolute error (MAE) between two adjacent steps  to stop the iterations. where M, N are number of columns and rows in the processed image. By setting a threshold for MAE value, the diffusion process can be stopped. This threshold value can be adjusted by clinicians according to the purpose of speckle reduction. When the despeckling method is used as a visual aid to improve the interpretation, a small diffusion time is enough to remove the speckle. On the other hand, if the method is applied as a preprocessing step, a longer diffusion time can be adopted. Step 1: For each point (x, y) belongs to 2D space of all real numbers ( x , y ) ? R 2 , calculate the gradient in x and y directions and estimate the absolute gradient magnitude ? I = I x 2 + I y 2 for local window of size w × w.
Step 2: Evaluate the diffusivity from Equation (20) and the principal components from Equations (21) and (11). Step 3: Calculate the median of I for each coordinate. Step 4: Solve the diffusion equation in (27) to update I i , j n + 1 from I i , j n and the calculated matrices at step n using the semi implicit scheme. Step 5: Complete all the pixels in the image and check for stopping criteria as in (28) as a function of n. Loop until the stopping a criterion is satisfied for time step t = 0.25. The performance of the proposed method is evaluated using artificial image, simulated phantom, and real US image. 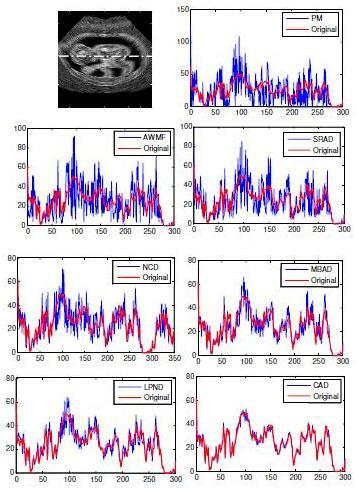 In each study, the performance of the proposed CAD is compared with Perona and Malik diffusion (PM), adaptive weighted median filter (AWMF) , SRAD , nonlinear coherent diffusion (NCD) , median boosted anisotropic diffusion (MBAD) , and Laplacian pyramid-based nonlinear diffusion (LPND) . The performance of our method is quantified using quality assessment metrics. The edge preservation ability is measured using figure-of-merit (FOM) [30, 31] and is based on three things: detection, localization, and spurious response. where N and Nideal are the numbers of detected and original edge pixels, respectively; d i is the Euclidean distance between the i th is a constant typically set to 1/9. Dynamic range of detected edge pixel and the nearest original edge pixel; λ FOM is based on all edges being found, all being placed in the correct location and no false alarms. The value is between the processed image and the ideal image. We used the canny edge detector  to find the edge in all processed results. Second metric is mean square error in this metric, the smaller the MSE value, the better is the denoising process. The convergence rate of MSE value is depicted in Figure 3 for CAD algorithm with respect to number of iterations. MSE value versus number of iterations. where σ g 2, σ e 2 are the variances of the noise free reference image, the error between the original and denoised image, respectively. where the standard deviation σ x = 1 N − 1 ∑ i = 1 N ( x i − μ x ) 2 1 / 2 and the mean intensity μ x = 1 N ∑ i = 1 N x i , covariance σ xy = 1 N − 1 ∑ i = 1 N ( x i − μ x ) ( y i − μ y ) are calculated using local statistics within a total of N windows. Constants C1, C2 < < 1 to ensure stability and N is chosen as 32. The SSIM has values in the 0 to 1 range, with unity representing structurally identical images. The SSIM values are calculated only for simulated images for which the original is available for comparison. where Ω is image region, N is pixel no. in the region. For good diffusion model, the homogeneous region in the image exhibits less contrast after diffusion than compared to the original one. The proposed CAD model and various state-of-the-art methods are applied on artificially simulated image with speckle noise of standard deviation 0.5, Field II software generated cyst and real US pediatric brain image. In this study, for PM and SRAD implementation, the time step Δt = 0.05 is chosen and 300 iterations are used. For LPND, 4 pyramid layers, 7 × 7 binomial filter for REDUCE and EXPAND operator, the Gaussian filter of σ = 0.1, Δt = 0.2, and MAE = 0.1 are set. For NCD Δt = 3, α = 1, s = 70, and β = 0.05 are selected for MBAD and AWMF, the filter mask of 5 × 5, median filter with σ = 2 and Δt = 0.2 are utilized. The execution time for each algorithm for 300 iterations is listed in Table 1. 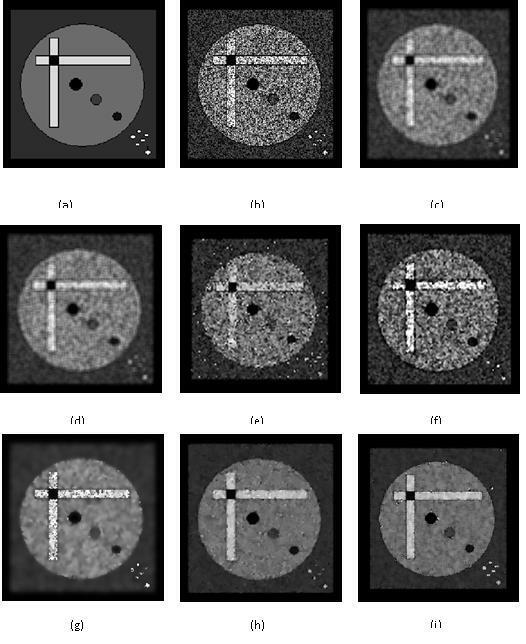 The artificially simulated image carries intersected horizontal and vertical rectangular target, three small cysts of varying intensities and five point targets embedded in the background of varying gray levels. 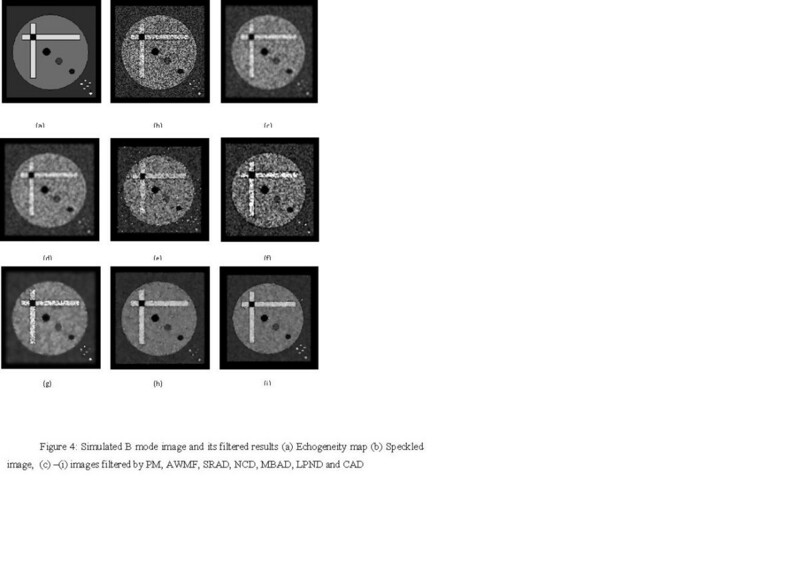 The results on artificial image are shown in Figure 4a–i. The original image of size 200 × 200 is artificially corrupted by speckle noise using MATLAB command (> > imnoise). 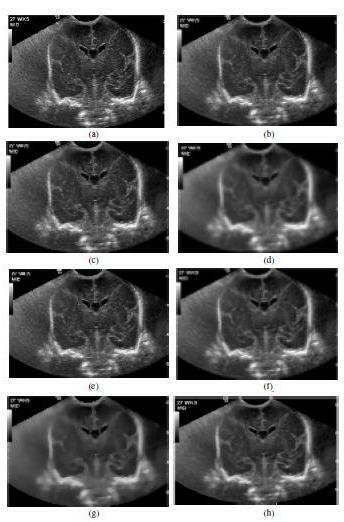 The original and noisy images are shown in Figure 4a,b. The processed results of different schemes are shown in Figure 4c–i. In this example, our proposed CAD comparatively provides better visual enhancement, point feature preservation and also avoids blocky effects and feature broadening problem. 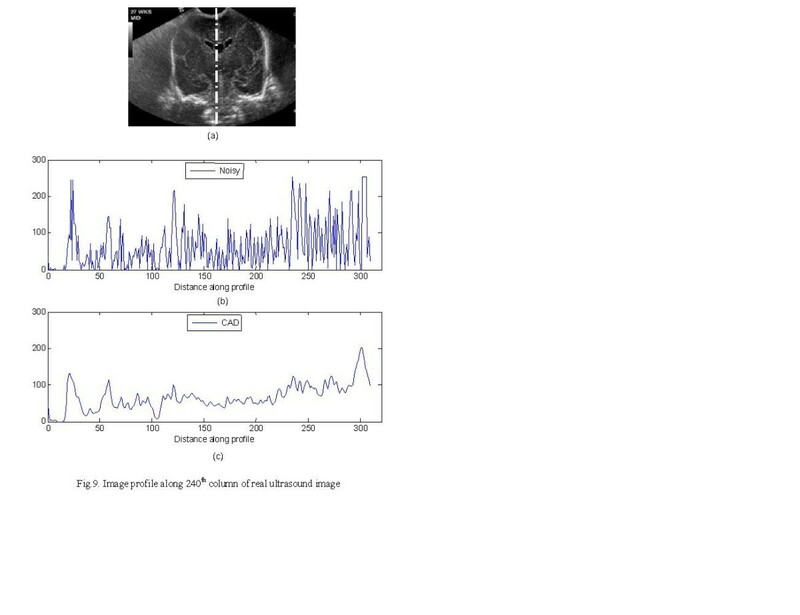 The performance of our method is also quantified using image profile measured along 89th column of the test image as shown in Figure 5. In each case, the profiles of filtered images are compared with profile of the original image. In this study, the CAD gives satisfied improvement over other techniques in terms of speckle reduction and edge enhancement. The three performance metrics SNR, FOM, and MSE are computed for all the methods and listed in Table 2. The CAD that carries larger SNR value corresponds to good quality. The FOM value indicates that the CAD is better than other methods in terms of edge preserving ability. Simulated B mode image and its filtered results. (a) Echogeneity map. (b) Speckled image. (c– i) Images filtered by PM, AWMF, SRAD, NCD, MBAD, LPND, and CAD. Image profile along 89th column of simulated B mode image. The performance of proposed method and other approaches on Field II software generated cyst are shown in Figure 6a–h. The foetus phantom is an 8-bit image of size 352 × 353 pixels. 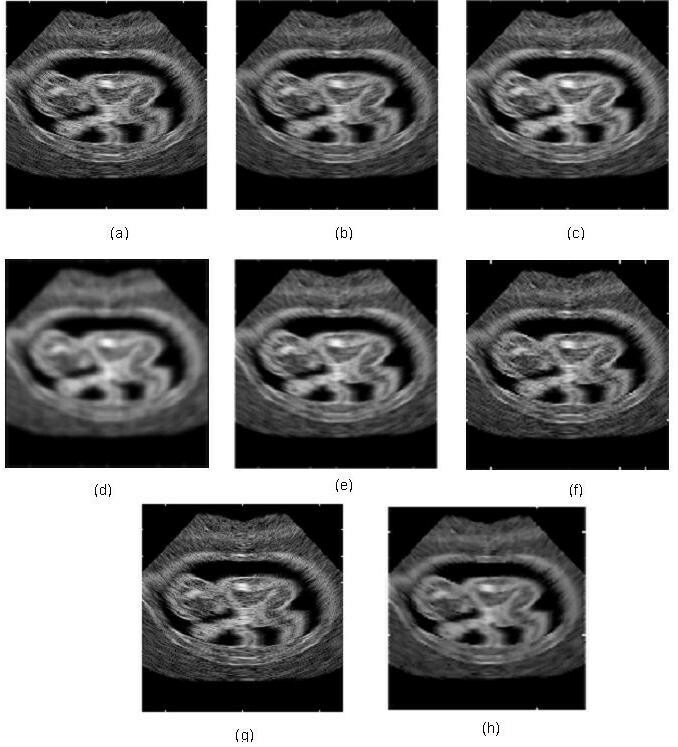 The image profile along 151st row of foetus image for CAD and other filtered results are shown in Figure 7a–h. The performance metrics were also calculated and listed in Table 2. All the experiments prove that our CAD gives improved result in terms of feature preservation, speckle reduction, and edge enhancement. An US image of pediatric brain of size 460 × 312 is used to test the performance of the proposed technique for real-time application. The results are displayed in Figure 8a–h. Simulated foetus image and its filtered results. (a) Noisy image. (b) Speckled image. (c–i) Images filtered by PM, AWMF, SRAD, NCD, MBAD, LPND, and CAD. Image profile along 151st row of simulated Field II foetus image. Real US pediatric image and its filtered results. (a) Noisy image. (b–h) Images filtered by PM, AWMF, SRAD, NCD, MBAD, LPND, and CAD. This study depicts that LPND shows sharper but jagged edges and gives a relatively low contrast. AWMF does not give satisfactory speckle suppression. NCD enhances edges, but it does not keep correct edge locations. PM and SRAD dilate bright regions and erode dark regions. With the SRAD, the boundaries of bright regions are broadened and those of dark regions are shrunk. MBAD enhances the edge coherence but cannot suppress enough noise. The profile along 240th column of the real US image is shown in Figure 9. The image profile of original noisy image and filtered result of CAD are compared. The performance metrics for Field II simulated image and real US data are listed in Table 2. The experimental results show that our proposed CAD method provides better speckle reduction, edge enhancement, and feature preservation. It also avoids blocky effects and point/linear feature broadening problems. Image profile along 240th column of real US image. SSIM values for different algorithms are calculated by using the constant values as referred in  for simulated phantom and Field II generated image for which the original images are accessible. The values are listed in Table 3. In this comparison, the proposed CAD exhibits comparatively high SSIM value for both the cases. For US image, the original noise-free image is not available and in this case, the contrast to noise ratio is calculated for two homogeneous regions in each case as shown in Figure 10. Contrast value of the homogeneous region should decrease after diffusion depending upon the quality of diffusion. Measured values of contrast for all three images for two different regions are listed in Table 3. In this study also our proposed CAD provides lower value of CNR compared to other state of the art algorithms (Table 4). Simulated phantom, Field II generated foetus, and Real US image with two selected regions for contrast measure. The performance of PM, AWMF, SRAD, NCD, MBAD, LPND, and CAD methods are compared in terms of SNR, SSIM, and FOM. Comparative results are shown in Figure 11 that clearly indicates that our proposed model gives superior result over the above-mentioned state-of-the-art methods. In terms of SNR criterion, our proposed CAD model gives about 23, 22, 17, 14, 9, and 5 dB improvement over PM, AWMF, SRAD, NCD, MBAD, LPND, respectively, for artificially simulated image with speckle of σ = 0.5, about 15, 12, 9, and 5 dB improvement over PM, AWMF, SRAD, NCD, MBAD, LPND, respectively, for Field II simulated image, about 15, 12, 9, and 6 dB improvement over PM, AWMF, SRAD, NCD, MBAD, and LPND, respectively, for real US image. 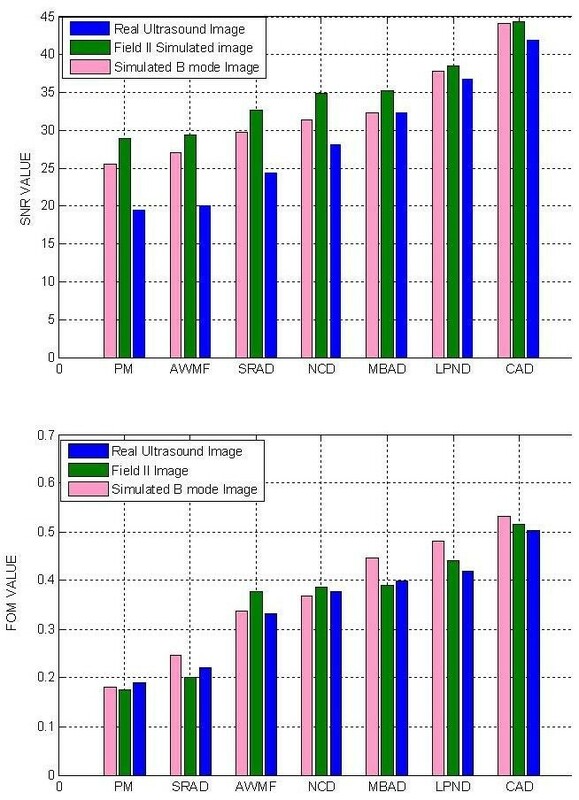 Our proposed model gives 360, 128, 51, 33.5, 26.5, and 20% improvement for artificially simulated image, 192, 156, 36, 33, 32, and 17% improvement for Field II simulated image, 197, 117, 59, 45, 19.5, and 11% improvement for real US image over PM, AWMF, SRAD, NCD, MBAD, and LPND, respectively. Performance comparisons of various methods in terms of (a) SNR (b) FOM. In this article, we propose a new diffusion model called CAD that reduces speckle, preserves information carrying features and also avoids blocking effects, point, and linear feature broadening problems. The new CAD model carries two terms: one is coherent diffusion term for speckle reduction and for structured region, organ surface preservation. The second term is a regulator term that condenses the diffusion and emphasizes thin linear and point features. In this scheme, the diffusion matrix is designed using local coordinate transformation and the feature broadening correction term is derived from energy function. The median filter is used as a smoothing operator. In CAD, the structured tissues which carry rich of information undergo AD and the speckle pattern undergo isotropic diffusion; this flow can be controlled by setting the local coherence value close to zero. The energy condensation component is included to emphasize the information carrying point/linear features, which controls the feature fattening, effectively for bright regions. In the implementation, we have used. The MAE value is set to 0.1 for artificial and simulated data and 0.2 for real US image. The simulation takes ≈ 300 iterations to converge to a stationary solution. Thus, the proposed method can be implemented practically to enhance the visual interpretation ability of radiologist with minimum cost and this method can also be used as a pre processing tool for many image processing task such as segmentation, feature extraction, etc. The author would like to thank Dr. Senthilvelmurugan, Radiologist from Kauvery Medical Centre Hospital, Trichirappalli, Tamilnadu and Dr. G. Jayakumar from Sarani clinic, Pudansandhai, Tamilnadu for their support and thoughtful comments.